Wow. The Autumn 2011 Innovation Learning Network InPerson Meeting was a chaotic magical dream state. I am not quite sure if I’ve woken back up. 150 innovators and leaders from around the country gathered to build the future of healthcare. The theme was complex yet simple: connected health. And it encompassed broad reaching policies and deep, yet to be developed technologies. 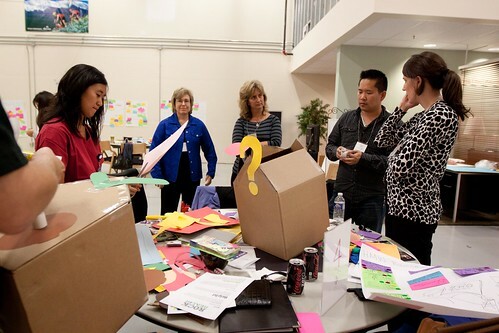 We sent the innovators on an innovation safari on Day 1 to fifteen extraordinary SFBay organizations. We exposed them to 10 super cool technologies and concepts in a progressive lunch (we paired finger foods with technology…and wow was that a cool way to learn!). And then we gave six hours to brainstorm and prototype healthcare in 2031. From SmartBathrooms and SmartSupermarkets, to a Healthcare Political Party and friendly cloud computing the future were as brilliant as they were diverse. All gave us a glimpse of what we know is to come. Now the hard work: dragging 2031 as fast as we can to the present. Our innovators will coalesce around the most promising ideas, the ones were passion is high and collaboration is needed….and do something about it. Stay Tuned!! Finally a special thanks to my home Kaiser Permanente and to my dear friends the California Healthcare Foundation. We co-hosted and sponsored this event.